Our offerings at Model Citizen tend to mirror our live event calendar. In the run-up to the annual Porsche Lit & Toy Show last March, for example, we loaded up on 1:43-scale P-cars. Well for us, June means Nissan Jam, a local gathering of classic and contemporary Datsun, Nissan and Infiniti products and the people who love them. Consequently, we’re stocking up on a variety of Zs, Skylines and other tasty treats for the marque faithful. To get you guys in on the fun, our Model Citizen/LaLD Model of the Month for June is AUTOart’s 1:18-scale Nissan Skyline GT-R (R33) V-Spec. The R33 GT-R saw Nissan’s motorsport footprint expand from touring car dominance to the world of international endurance racing: R33s were run in the GT1 class Le Mans in the mid-1990s, scoring strong finishes in 1995 and 1996. The mountains of technology poured into these race efforts was mirrored in roadgoing models; the R33 GT-R V-Spec featured cutting-edge ATTESA E-TS Pro four-wheel steering and Nissan’s legendary RB26DETT twin-turbo six. As for AUTOart’s 1:18-scale replica of the GT-R V-Spec, well, it’s exactly what you’d expect: an AUTOart. Engine and interior detail are top notch, and trim pieces are crisply rendered. 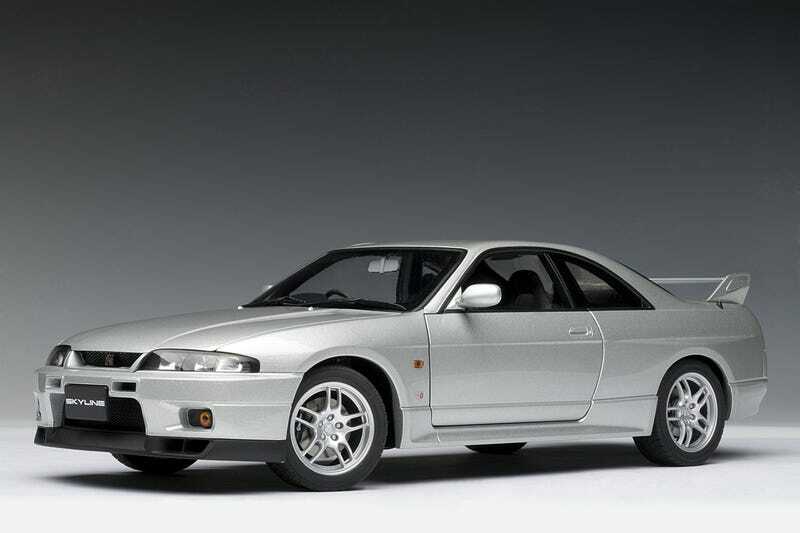 But, for June, the best feature of the AUTOart R33 GT-R is the price. Thanks to a special buy from AA, our regular price on this car is only $115, but for LaLD readers this month we’re offering the R33 for $99 shipped in the lower 48. Use promo code LALDJUNE to receive the discount.